It’s been a couple weeks since Atomic Blonde released to Blu-ray and 4k Blu-ray Disc, and in case you haven’t gotten around to redeeming the digital copy code let us fill you in how it works. 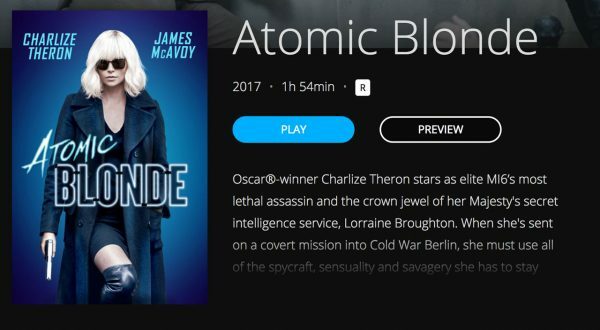 Atomic Blonde digital copy can be redeemed through UltraViolet (myUV.com), UltraViolet partners (like UPHE.com), iTunes, and Movies Anywhere. The digital code is provided with the Blu-ray combo editions of the film. If you purchased the Ultra HD Blu-ray edition you should get the Digital 4k format. On MoviesAnywhere we were already logged in, so the code automatically carried over and redeemed our copy of Atomic Blonde in digital format. Upon checking with Vudu, the code gave us Vudu’s Digital UHD format. We’re not sure, however, if you redeem the code with iTunes will you get the Digital 4k edition automatically (iTunes has the same price for Digital HD and 4k). If anyone redeemed the code from a 1080p disc and got the Digital 4k also will you let us know in the comments? If you haven’t picked up Atomic Blonde yet, it’s available on disc in Blu-ray, 4k Blu-ray, and several exclusive editions from Best Buy and Target. For those of you who gave up discs this year, the film can be purchased in Digital 4k from Vudu for $14.99.